New York mayor de Blasio booed during police academy graduation speech. 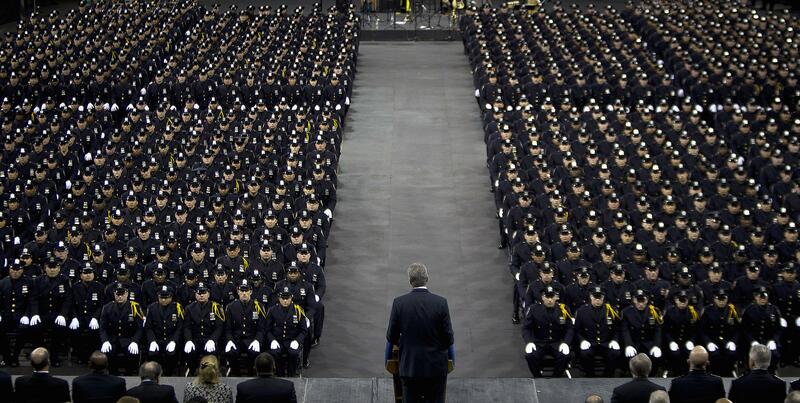 New York Mayor Bill de Blasio speaks to the New York City Police Academy graduating class. New York City Mayor Bill de Blasio’s tense relationship with the city police force was again on display Monday afternoon when he addressed recent graduates at a police academy graduation ceremony. Many in the NYPD and police unions are upset with recent remarks by the mayor that they percieve as a lack of support for the police force. Over the weekend, de Blasio got a chilly reception from the city’s police officers, who turned their backs on the mayor when he spoke at the funeral of one of the officers killed by a gunman in Brooklyn last week. De Blasio presided over the graduation today of the nearly 900 cadets at a ceremony in Madison Square Garden. Boos and catcalls cascaded down upon the mayor when he was introduced. There was a smattering of polite applause. At one point de Blasio told the cadets, “You didn’t create problems,” and someone in the crowd shouted audibly “No, you did!” The recruits were stoic.